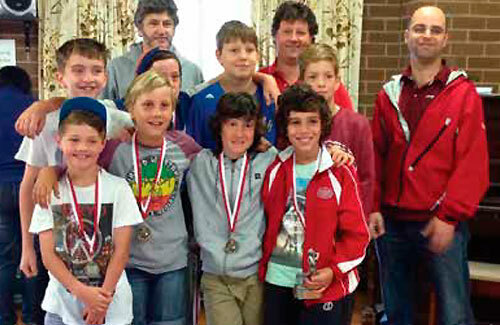 WHAT a big season we’ve had at Warrandyte “Juniors”. Three additional teams running around the park, two teams in the same age level for the first time, and we did it at both Under 12 and U10 levels. U14s didn’t exist last year, however, this year they made the Grand Final and almost notched up a flag for the club. The U16s went up a level, despite losing its batting and bowling award winners from the previous season, and equipped themselves admirably. Imagine what its going to be like next season when we have clubrooms and are not living out of a shipping container? Again, thanks to all for everyone’s patience and willingness to make due with the circumstances – a true Warrandyte spirit. There has been significant improvements/ changes this season implemented to help grow the juniors into a strong, fun and competitive environment. It is hoped the kids will become lifelong cricketers and help strengthen the seniors in the years to come. Thanks to all the coaches, assistant coaches, team managers and junior committee members, without your help and commitment we would have not made the inroads into providing such an environment. But, the job is only just started and I’m sure you all will “volunteer” again next season when I tap you on the shoulder. It would be remiss of me not to mention Harper Oehlmann who won the RDCA U14-2 Bowling Award. An awesome effort, considering he won our U14 most improved and bowling awards as well. Our trophy winners (mentioned below) show you that many of the kids have had outstanding years, led by our team champions: Jack Poole (U16s), Darcy Poole (U14s), Tom Jackson (U12s Red) and Ethan Ward (U12s White). Again a big thank you to our sponsors, Steve McGovern at my1300.com.au and John Argyrew at precisioncut.com.au your generosity has allowed us to get much of our initiatives this season underway or done. Of course we can’t forget Warrandyte Lollies & Treats, who supplied “Lolly Money” for match awards. If anybody else wants to get involved in a sponsorship arrangement, please let me know at the club. Yes, season 2013/14 has drawn to a close. Make sure you keep an eye on our WCC Juniors Facebook page to see what’s going on with cricket during the footy season. It was a great season, but I’m sure next one will be even better. U16s: Team champion, Jack Poole (350 Points) – 245 runs, 6 wickets and 9 catches. Batting Award – Jack Poole – 245 Runs @40.83; Bowling award – Mark Barker – 8 Wickets @21.50; fielding award – Jack Poole – 9 Catches; coaches award – Todd Malt – 24 runs, 3 wickets and 4 catches; most improved – Ryley Reardon – 27 runs, 3 wickets and 1 catch; Round 9 Vs Montrose, Luke Philpott, 5/38. U14s: Team champion – Darcy Poole (410 Points) – 265 runs, 11 wickets and 7 catches; Batting Award – Darcy Poole – 265 Runs @53; Bowling Award – Harper Oehlmann – 17 wickets @7.06 (also, RDCA U14-2 Bowling award with 6.46 average); Fielding Award – Bailey Bowyer – 9 catches and 1 run out; Coaches Award – Patrick Grocott – 150 runs, 4 catches and 1 run out; Most Improved – Harper Oehlmann – 33 Runs, 17 wickets and 2 catches; semi final v Olinda, Darcy Poole 5/12. U12s Red: Team Champion – Thomas Jackson (194 Points) – 89 runs, 9 wickets, 2 catches and 1 run out; Batting Award – Hudson Rostron – 110 runs @18.33; Bowling Award – Thomas Jackson – 9 wickets @16.22; Fielding Award – Harry Brown – 3 catches and 1 run out; Coaches Award – Jake Stubbs – 71 runs, 4 wickets and 1 catch; Most Improved – Jordan Morris – 16 runs, 5 wickets and 1 catch. U12s White: Team Champion – Ethan Ward (262 Points) – 152 runs, 7 wickets & 8 catches; Batting Award – Ethan Ward – 152 runs @25.33; Bowling Award – Christopher Rakuscek – 10 wickets @7.10; Fielding Award – Ethan Ward – 8 catches; Coaches Award – Brady Poole – 83 runs, 9 wickets, 2 catches and 2 run outs; Most Improved – Lachlan Haberfield – 81 runs, 4 wickets, 2 catches and 2 run outs.